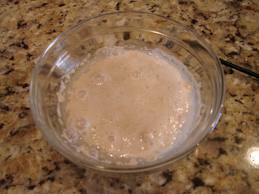 Self Reliant Network: No yeast- Make your own. There are two basic types of yeast for baking: active dry yeast and compressed fresh yeast. Active dry yeast comes in two varieties: regular and quick-rising. Any of the three can be used successfully in bread-baking. The differences among them are these: Active dry yeast is dehydrated yeast; it is granular and comes in 1/4-ounce packages. Some recipes call for active dry yeast to be "proofed" in warm water and sugar before the flour is added to make the dough. In other recipes, active dry yeast can be added with the flour to the warm water/sugar mixture. Quick-rising yeast is also active dry yeast, but it has been formulated to raise the dough in one-third to one-half the time. In general, just use the type of yeast called for in your recipe. However, feel free to use the dry yeasts interchangeably.